The Shaman: Spectacular New Canadian Orchestral Music: CD Review, 19th May 2018. One of the issues with which the large colonial countries such as the United States and Canada grappled was the tendency for all their composers to sound like second rate European composers. With the dawn of the 20th Century there was the obligatory attention to folksong but that is also arguably Eurocentric…not bad, mind you, just leaving out the Native Americans or, using the elegant Canadian term, First Peoples. Eventually both the U.S. and Canada began to pay attention to indigenous traditions of the peoples they had conquered. One suspects that an appreciation of the social and spiritual traditions of indigenous peoples also encouraged a different view of the very landscapes. Finally to the disc at hand. 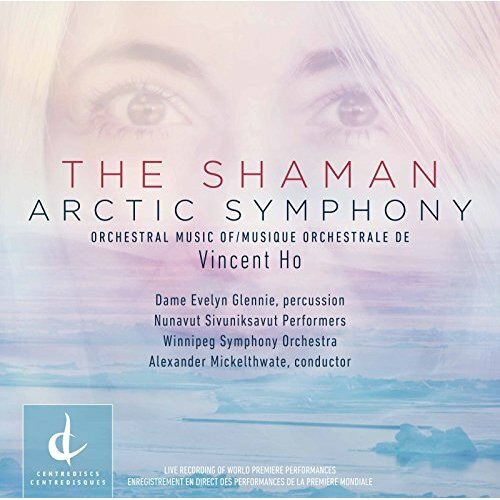 This is a beautifully recorded live concert of two major works by Mr. Ho, “The Shaman” (2011) and Arctic Symphony (2010). Both are for large orchestra and inhabit a very listenable realm melodically and harmonically. That is NOT to say that these are ordinary or simple works. In fact they clearly embody the work of a well trained and thoughtful artist. This is exciting music and the audience response at the end of each work was highly approving. Your reviewer heard the Carnegie Hall broadcast of The Shaman and jumped at the opportunity to review this disc. Dame Evelyn Glennie is reason enough to pay attention. This (essentially) Concerto for Percussion was written for her and she is ostensibly the shaman of the work’s title. Her performance is simply spellbinding. The piece has three numbered movements and an interlude. I will leave it to the program note readers to plumb the additional depths of meaning embodied in the concerto but I will tell you that if you are not enthralled by the “fire dance” finale you may very well be dead.